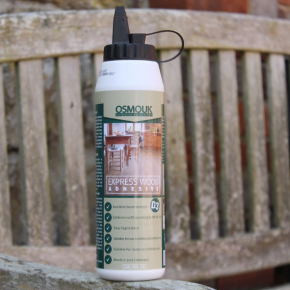 Osmo UK, the eco-friendly wood and finishes specialist, has expanded its range of wood adhesives, as a new durable product developed for use in the home joins the range. The new D3 Express Wood Adhesive is a ready to use water resistant adhesive that is specially formulated for use on interior and exterior wooden furniture and joinery. The hard-wearing formula of the D3 Express Wood Adhesive is suitable for gluing all types of wood. Developed not only to secure wood to wood, the versatile adhesive can fix paper, cardboard, and textile-backed PVC to wood and board. D3 Express conforms to EN 204, meaning the adhesive can be used on interior furniture with frequent short-term exposure to running and condensed water, or heavy exposure to high humidity. The supreme bond strength is specially designed to suit moisture-resistant bonds. Outdoor timber constructions such as window frames and doors, if not directly exposed to weather, can be bonded with the D3 Express. Application is made simple due to the paste consistency – the D3 Express Wood Adhesive can be easily applied using a mechanical glue spreader, brush, hand roller, or air activate glue gun. To achieve great results, Osmo UK recommends the surface is clean and dry prior to application and that the product is thoroughly mixed before use, ensuring full water resistance is achieved after seven days.